From the get go, it appears the Narciso Rodriguez brand aimed to create a similar cult following to their original, with a few variations: the black rectangular bottle has been replaced by a white cube. The musk was replaced by ambereine accord and a sheer, crystalline amber. The synthetic orange blossom floral theme was replaced by a nondescript gardenia-rose that to my nose smells more similar to a Madonna lily, actually. What remains consistent with the original Narciso Rodgriguez For Her is a clean, woody vetiver - only a little amplified here, and paired with patchouli, of all animals. And that's what made me take notice. NARCISO is a little too sweet at first, but with a cleanliness that does not weight it down. For reference - the opening and up until the vetiver makes an appearance, this is similar to scents such as DiorAddict, tinged with a touch of Pure Poison and a hint of inky, murky violet notes, not unlike Kisu. The vetiver makes it more balanced and interesting, along the lines of Eau de Merveilles of all things. Who would have thought that could happen? So all in all, an ambery-woodsy vetiver with hints of violet and vague white flowers. It evolves on the skin more than the musky For Her does. Similarly to Narciso Rodriguze For Her, the idea is not exactly original*, but the execution is what made it exceptional. The perfectionism of the bottle design and the simplicity of the campaign made it stand out in the crowd. Add to that an addictive scent that is an slightly more sophisticated formulation of street vendor variety of Egyptian Musk and a stark packaging design - et voila! A cult fragrance was born. 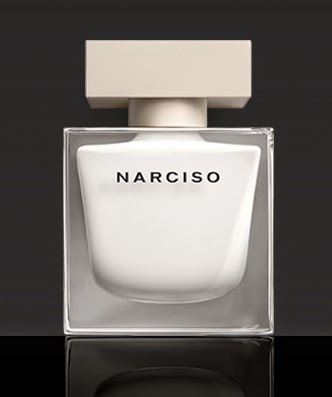 NARCISO needs to compete with an even larger crowd, and with an already cluttered collection of fragrances from this designer, which includes two or three sequels of For Her, one masculine fragrance, and the glass mirror reflection of "essence". Not an easy task, and indeed simplicity was the only ticket to success. And I foresee this to become as successful as For Her as it could possibly be (which is impossible, because whatever this brand creates will always stand in its solar-musky-shadows). * As a point for reference: NARCISO reminds me of a little bit like Obsession, a tad like Prada Ambre Intense Pour Homme, and a lot like Tocade. These three perfumes seemingly have very little in common; but they all share similarities with NARCISO.